Andhra Pradesh CM and TDP chief N Chandrababu Naidu along with 20 leaders of non-NDA parties moved the Supreme Court on Wednesday, seeking review of its April 8 order directing the Election Commission..
▶ Videos for "Chandrababu Naidu"
Andhra Pradesh Chief Minister Chandrababu Naidu hit yet again questioned the credibility of the EVMs. He claimed that there are rumours that people from Russia who are active and alleged that they hack..
YSRCP leader YS Jaganmohan Reddy on Tuesday alleged complete breakdown of law and order in Andhra Pradesh and misuse of police machinery by chief minister N Chandrababu Naidu and sought governor ESL.. The song was launched in presence of senior party leaders at the party central office in Hyderabad. The campaigns have been designed along the lines of party chief Jagan Mohan Reddy's Praja Sankalpa Yatra where he walked 3,648 kms to understand the issues concerning the people of the state. The Andhra Pradesh chief minister did not take name but indirectly accused YSRCP chief YS Jagan Mohan Reddy of killing his own uncle, YS Vivekananda Reddy. Andhra Pradesh chief minister N Chandrababu Naidu on Monday said the Election Commission has to clear people's doubts over the functioning of Electronic Voting Machines (EVMs) and take all steps to.. The Telugu Desam Party (TDP) has defended sending technical advisor Hari Prasad Vemuru to the Election Commission (EC) along with Andhra Pradesh chief minister N Chandrababu Naidu to discuss the issue..
Opposition parties on Sunday held a meeting to discuss the issue of EVM malfunctioning and said they will approach the Supreme Court again to demand that at least 50 per cent of paper trails be..
EC has written to the Telugu Desam Party asking how a person with criminal antecedents could be a part of a delegation led by its chief N Chandrababu Naidu during his visit to the poll panel on..
"Would like to state that instead of focusing on the issue, the Commission is trying to avoid the situation," read TDP's response to EC. When the Election Commission agreed to Andhra Pradesh chief minister N Chandrababu Naidu’s request on Saturday morning to let an “expert” from his delegation come back for a more technical.. Questioning the transfer of several officials ahead of voting, he alleged the poll body "failed to live up to the spirit of constitutional duty" during elections in Andhra Pradesh which was "dangerous..
Lok Sabha Election 2019 LIVE updates: A day after Andhra Pradesh went to polls, Chief Minister Chandrababu Naidu said, "Tomorrow (Saturday), I'm meeting the Election Commission. 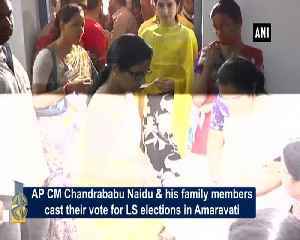 I'm going to..
Andhra Pradesh Assembly Election 2019 Voting LIVE Updates: After YSRCP chief Jagan Mohan Reddy alleged that Chief Minister Chandrababu Naidu had threatened the Election Commission, TDP released a video..
Andhra Pradesh Chief Minister and Telugu Desam Party (TDP) President N. Chandrababu Naidu on Thursday demanded repoll in around 150 polling stations due to the non-functioning of Electronic Voting..
Chief Minister N Chandrababu Naidu shoots off three letters to election commission and Director General of Police (DGP) over malfunction of Electronic Voting Machines (EVMs) and violent incidents..
South States Lok Sabha Election Voting LIVE updates: In a letter to Andhra Pradesh Director General of Police (DGP) RP Thakur, TDP president and Chief Minister N Chandrababu Naidu stated that the..
South States Lok Sabha Election Voting LIVE updates: YSRCP chief Jagan Mohan Reddy on Thursday alleged that Chief Minister Chandrababu Naidu met Andhra Pradesh Chief Electoral Officer Gopalkrishna..
Andhra Pradesh Assembly Election 2019 Voting LIVE Updates: Andhra Pradesh chief minister Chandrababu Naidu has demanded repolling at locations where EVMs malfunctioned. Andhra Pradesh Chief Minister and Telugu Desam Party (TDP) President N. Chandrababu Naidu, YSR Congress Party chief Jagan Mohan Reddy and RSS chief Mohan Bhagwat were among the early voters who cast..
Andhra Pradesh Assembly Election 2019 Voting LIVE Updates: So far, 36 Assembly constituencies in Andhra Pradesh have reported EVM glitches. Several booths in Chandrababu Naidu's Kuppam constituency..
Lok Sabha Election 2019 Phase 1 Voting LIVE Updates: Andhra Pradesh chief minister N Chandrababu Naidu and his chief rival, YSRCP chief Jaganmohan Reddy, have both cast their votes in the early hours..
South States Lok Sabha Election Voting LIVE updates: In the wake of reports of faulty EVMs coming from across Andhra Pradesh, chief minister Chandrababu Naidu reiterated his demand for replacement of..
Andhra Pradesh Assembly Election 2019 Voting LIVE Updates: Voting has been delayed at a number of polling booths in Andhra Pradesh due to malfunctioning EVMs. 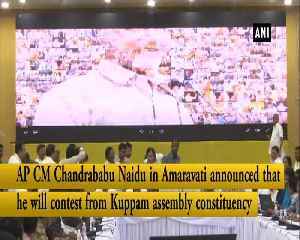 Chandrababu Naidu has reiterated his..